In 2014 the world finally spun off its axis into a suffocating vortex of incomprehension (just like the last half of Interstellar). Yet consolation was always available in the form of culture, which continued despite the progressing apocalypse. The next few posts will include some of this year's cultural consolers and a few of its challengers too - from Chekhov to Aphex Twin, the Oxford historian Selina Todd to the posthumous Vaclav Havel, Gang of Four to Gyorgy Lucacs, Nietzsche to the economist Thomas Piketty and many more. Not released during 2014 or even during this century, Gang of Four's first two albums were nevertheless essential listening this year. Moving back to Britain in July was something of a sensory and informational overload: suddenly I was woken from the mute, balmy slumber of life abroad by a turf war waged with the molten flak of decades of unsold consumer goods. It was like a Hieronymus Bosch painting sponsored by Matalan or one of those video-reels of the 1970s. Tory MPs hunted down disabled people for the metal parts of their wheelchairs, vital apparently for "paying down the deficit." Social welfare claimants were forced to perform improv at sundry rural Fringe festivals for the amusement of bored shire folk. The homeless were forced to invest the goods they got from food banks in dubious entrepreneurial schemes intended to help them innovate their way out of destitution. The semi-apocalyptic din of Coalitionland that I had happily ignored for years was suddenly intensely close and personal. Gang of Four were the soundtrack to this rude awakening: not for the detached observer, they revelled in the chaos, and like divers excavated little oil-black pearls out of it. "Show me a ditch," they chant, "and I'll dive in it." Gang of Four's martial swing - an almost funky guitar strut driven to maddening speeds - evokes the authoritarian style of British politics in the 1980s. It heralds the hip-swivelling self-certainty of the turn to right-populism during the Thatcher years, a turn that utterly crushed both moderate and more radical varieties of Labourist social democracy. It is the sound of old means of understanding and organising the social world - punk, Dr. Feelgood, disco, left-wing politics - crumbling as a maniacal, consumerist gaiety usurps them. 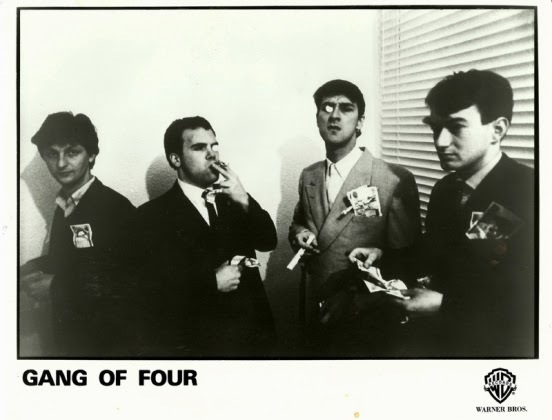 "Things all look a whole lot better for the working classes," Jon King sings on Gang of Four's 'I Found That Essence Rare'. One is returned irresistibly to footage of Thatcher occupying some oversized machine - a tank or a bulldozer - the self-conscious symbol of violent national renewal, of a return to great things via the irresistible force of "creative destruction." In a year characterised by centenary hero worship, this style has been excitedly reappropriated, with a galaxy of nobodies queueing up to "remember the sacrifice" - without, of course, ever questioning the causes of that "sacrifice" and the senselessness of such a terrible collective death sentence. Unsurprisingly a burst of intolerance has emerged in the prevailing mood of death and nostalgia. Gang of Four's music stands as a powerful incitement to challenge such popular self-righteousness. "Just keep quiet, no room for doubt," they sing. "All this talk of blood and iron is the cause of all my shaking.... The fatherland's no place to die for!" Gang of Four take the alienated protagonist of modernism and plunge him (normally it's a him) unreconstructed into a fragmenting social environment: "How can I sit and eat my tea, with all this blood flowing from the television?" the affectless narrator of '5.45' complains. These weak manifestations of a first-person subjectivity - in effect, men we are invited to watch flail in the grip of micro-practices of power - are cut across yelped slogans, which sometimes function as dim reminders of struggles now taking place elsewhere, out of view of the atomised individual: "Guerilla war struggle is a new entertainment." Yet some of Gang of Four's best songs are mimetic - personifying those who are active participants in the creation of this new, paranoid world. Here the domestic scene is penetrated by supposed military virtues, as if the retreat from public life by Britain's TV-sozzled masses has resulted in the internalisation of values once championed by the outward face of Empire: "Discipline is his passion/Order his obsession/Now he says there's none." In a sense Thatcher redoubled, through our collective relegation to the privatized domicile (famously there was no such thing as society only families and individuals), the very metaphorical domestication of the post-imperial British (no longer to rule the waves). Thatcher's rebellion against "decline" merely resulted in the destruction of the agon - the public marketplace of ideas - that had supposedly fuelled British inventiveness in the first place. What is left is a simultaneously commodified and militarized daily life bound up with a growing conviction that what is "out there" is dangerous; that we are victim to a total social breakdown epitomized in such prosaic phenomena as late-running trains: "Outside the trains don't run on time." 2014 found a privatized Britain getting ever twitchier - and not only over late trains.